TheGunBlog.ca — Canadian Senator Mobina Jaffer hasn’t received a single letter supporting Bill C-71, but has gotten many letters opposing the government’s planned law against hunters, farmers and sport shooters, iPolitics reported yesterday, citing the politician. “I haven’t received one letter that is in support of the bill,” the news website quoted Jaffer as saying in an interview. Jaffer, who could hold the deciding vote to pass or defeat amendments to Bill C-71 in the senate review committee, has received many messages of opposition from lawful gun owners being blamed for violence in cities, iPolitics reported. “What they’re saying is, ‘Don’t punish us instead of going after them (gangs and criminals),’” the British Columbia senator told the news organization. Jaffer was with the Liberal Party and is now non-affiliated. She won’t decide on any amendments until the hearings at the Standing Committee on Security and National Defence are complete, iPolitics said. More than 40 witnesses are planned, the news website said. Hearings start Feb. 18. Jaffer is the deputy chair of the committee. The chair, Gwen Boniface, is a former president of the Canadian Association of Chiefs of Police, a lobby group that supports Bill C-71. The Liberal government is pushing Bill C-71 to immediately prohibit and eventually confiscate rifles from their lawful owners, and to make it harder for federally licensed shooters to buy, sell, own and transport guns. It will hand the personal details of Canadian gun owners as of 2012 to the government of Quebec, after the federal police said it had deleted the information. Bill C-71 will further violate privacy by forcing licensed owners to tell the federal police who they’re thinking of selling a gun to, even if the transfer never goes through. The government is also looking at banning more guns and banning home firearm storage, on top of the prohibitions in Bill C-71. The Conservative Party, led by Andrew Scheer, is the only party that has pledged to repeal Bill C-71. Scheer is the only leader to reject new bans. All guns are banned already for everyone unless they have a licence. Get yours here as a free download or buy it on Amazon via TheGunBlog.ca Store. Every senator got a copy from the Canadian Shooting Sports Association. 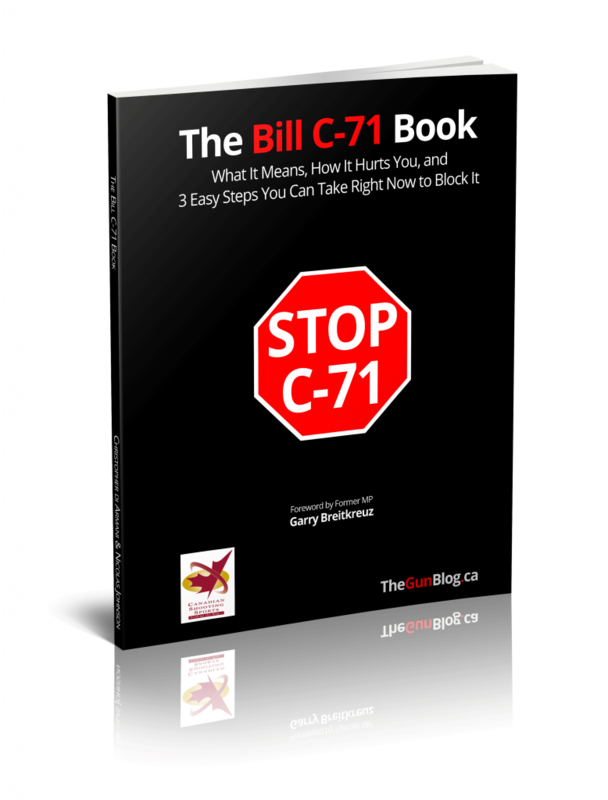 Conservative Senators plan to “gut” Bill C-71, the Hill Times reports. – Even if Conservatives gut the bill, Senate as a whole can still reject any amendments and adopt it as is.